It feels like we are at a neighborly backyard barbecue, except that our table stretches a half-mile up Victoria Street and there are more than 2,000 people milling about. In fact, we’re at Create: The Community Meal, a multi-media public art project by artist and longtime Frogtown resident Seitu Jones that aims to lower the barriers to healthy food choices. Jones provided each of the hosts with a set of prompts to get us sharing food stories and talking about how we can impact access to healthy food. But we don’t really need them. Our plates piled with free-range chicken, black beans and rice, collard greens, mixed green salad, and corn bread, much of which was produced sustainably at small local farms not 50 miles from where we are sitting. We take our first bites and the food is delicious and people just start talking. Jones is a member of Afro-Eco, a local environmentalist organization, which in 2009, worked with three other area nonprofits to secure a grant from the U.S. Department of Agriculture to assess the food needs of four St. Paul communities, including Frogtown. In the survey process, Jones expected to hear people talk about cost, access, and transportation issues. Jones began thinking and talking about an art project that would alleviate the fear of cooking, demonstrate healthy meals, and introduce people to their local farmers. When one thinks about public art, the first thing that often comes to mind is a sculpture in a park. Public Art St. Paul does that, too, but in working on the Central Corridor plan, the artists wanted to impact large systems—the city’s entire sidewalk system, the sewage management system, or in the case of Jones, the food system. In 2012, Public Art St. Paul decided they needed a demonstration project for the Central Corridor plan. “We needed something that would spark, so people would really understand what we were talking about here,” says Podas-Larson. Jones’ idea for a large public meal fit the bill. A year later, Jones and Public Art St. Paul secured $50,000 from The Joyce Foundation in Chicago. 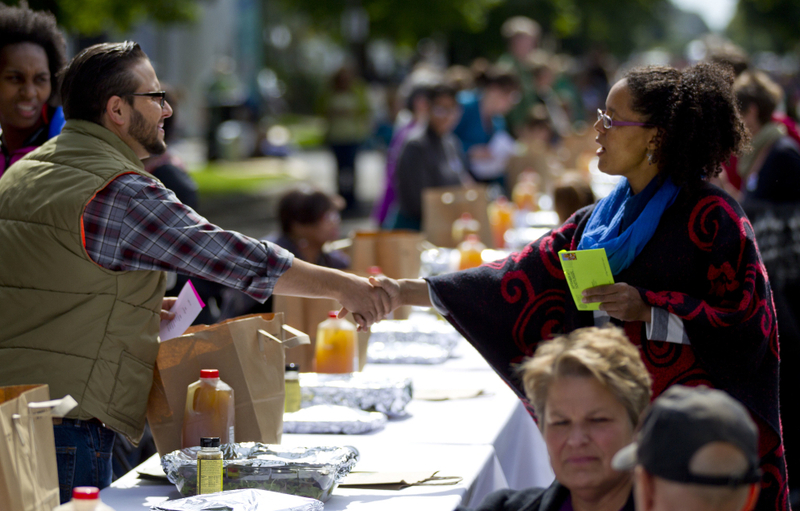 Since then, the organization has provided much-needed production muscle, including everything from getting permits to training the 400 volunteers needed for the community meal, to helping Jones canvas the blocks surrounding the meal’s location to ensure that people in the neighborhood make up half the guests. To describe Create: The Community Meal as ambitious is an understatement. In addition to the community meal, Jones commissioned two ingenious mobile kitchens. Each one is comprised of three modules that open Jack-in-the-box style to provide a tiny kitchen, washing station, and hot and cold storage. They can be attached to bikes or stacked on a flat bed and wheeled out into the community for pop-up cooking lessons. Jones has also spent much of the last year and a half in backyards, schools, and at smaller community meals, collecting food stories from Frogtown residents. He has chronicled their memories and asked questions about how they understand the food system. Jones heard, again and again, that food is one way that we can show our love for one another. The stories informed the project and Jones hopes they will end up in a published collection of some kind. On the day of the meal, the conversation feels almost confessional. Scott Holm tells us he grew up on a dairy farm, but early in his career he spent a lot of time on the road, eating essentially junk food. When he finally got a job based closer to home, he says: “I didn’t want to do that anymore. I decided I could make the effort to cook.” He gets most of his vegetables from the farmers’ market and when a man across the table from him says that all the food he buys is packaged or pre-prepared, Holm offers that it’s easy and quick to cook a chicken like the one we’re eating. And so we do, but we do not go quietly. As we walk back to our homes and cars, the air is full of chatter, people talking about planting boulevard gardens, distributing free planters, and launching mobile carts to sell sustainable produce curbside—ideas for change. Photo credits, from top: Andy King, Andy King, Bob Muschewske. Wow, I've been working on a very similar project for Asheville. First conceived as a potluck, we may shift to a "stone soup" model, where ingredient contributions are prepared by a team of volunteer chefs. But everything's free; or rather, shared. Of course, these are just special events. The real change takes place when people are able to fend for themselves. My organization teaches wild food foraging which creates the ultimate food security. What a wonderful idea. I went to college at Macalester in St. Paul, so I know just where Frogtown is.